Having a deck built for their home is a dream for most homeowners. Price, quality and professionalism in how a deck is built are important factors to consider before making that dream a reality. Many are worried of being shortchanged or inconvenienced in their daily lives by uncompleted structures for days and maybe weeks. Not knowing how the deck will look like until the job is done is also another deterring issue. 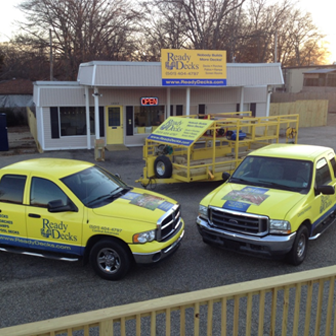 The Ready Decks Company, founded by Bradley Johns in 2001 was established to provide the ultimate consumer experience. It can be summed up in three words which are Quality, Value and Integrity. The single goal is to build quality decks and porches on site in the shortest amount of time possible while giving homeowners a value -for- money structure. How is it possible for a deck to be built in a day? Will the quality be compromised in any way? How long will the deck structure stand? These are legitimate questions with some real answers. After much research and development, a patent-pending building system was formulated that saves time and energy. Every foot step taken in the construction process has been analyzed, the wastage of lumber, engineering and accounting aspects evaluated in order to pass on savings to consumers. With the help of patented tools and an efficient trailer, a fast and unique way of building a deck on site is possible without jeopardizing the quality. A number of predetermined sizes have been set, from an 8’ x 10’ to a 16’ x 32’ deck; the right amount of lumber is easily calculated and with a highly trained professional crew can be built as quickly as an hour to 5 hours. Prices for these deck sizes are fixed and guaranteed, making it easier for homeowners to decide on the right ones for their homes. Apart from knowing what the cost of the total deck would be, homeowners also have the privilege of viewing what their deck would look like with the use of an I-pad app specially designed for deck applications. For any good product, using the best materials will ensure an excellent outcome. The use of Southern yellow pinewood for deck building is a great choice because of the price factor, availability and durability. Premium grade treated lumber is stocked in-house in every franchisee location and hand selected at the mills. This ensures the elimination of large knots, sap lumber and other flaws like heart-of-pine boards. The use of Southern yellow pinewood for deck building makes it cost effective because of the price factor and availability. Particularly designed for swiftness, resilience and strength, ACQ approved hot dipped galvanized ring shank fasteners are used in the building processes. These fasteners are able to resist corrosion more than screws and can hold the decking parts together for longer periods of time. Typically, deck posts sit above pads or footings by Polyvuk. These are specially made to protect the posts from soil and moisture. They are very durable and cover a wider area for the posts in the event of soil movement. Every deck built is backed by a one year limited warranty against flaws during installation effective from the date it was built. Even in treated pine wood, its natural appearance will be altered due to weather exposure and when left unprotected tend to shrink, warp and cup which is a normal characteristic of pinewood. The warranty covers defects arising from poor workmanship and materials will be replaced at no cost to the consumer. The manufacturer’s warranty is a direct-from-the-mill assurance to replace materials caused by rot from water damage and insects. With the perfect combination of quality materials, one- of- a kind Ready Decks building system backed by a lifetime limited warranty and skilled builders, a deck can be built not only in a day but look better and last longer than any other outdoor creation. It also adds value to your property and increases your quality of life.